A wonderfully complex tale beautifully told that focuses on one of the most awe-inspiring man-made structures in the world and an issue that loomed large in my own young life, well, how can that be wrapped up in a single book? Shell is set in Sydney when the opera house construction was underway and coincidentally, conscription to send men to fight in Vietnam began, in late 1965 and 1966. Pearl is a journalist, and because she’s demonstrated against the war, she’s relegated to writing for the women’s pages. After her mother died, she mothered her two younger brothers until she left for school. They walked out of the institution that took them and Pearl never escaped the guilt for leaving them. She undertakes a search for them when the draft threatens. Their reunion is loving but complicated by the necessity for Pearl to accept them as men making their own (misguided) decisions. Pearl meets Axel, a Swedish glassmaker working on a sculpture for the opera house, obsessed with the architect Jørn Utzon. Axel suffered the loss of his father, who worked to save Swedish Jews during World War II. Not only did he lose his father, but suffered for Sweden being neutral during the war while other Scandinavian countries were invaded. As in another book I loved (Five Bells), the most beloved character here is Sydney itself. 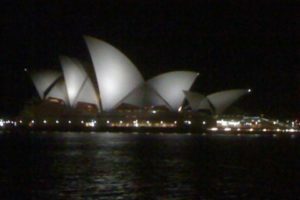 The author’s other books are set in Brisbane, but it’s clear she fell in love with Sydney, especially with the opera house. Sometimes she goes on at length about its beauty, and sometimes, it’s just a casual reference. When Pearl is talking about effective war protests with her friend Ray, his face is turned toward the Harbour Bridge seeing the car lights. “Pearl followed his gaze. The bridge leapt miraculous from one side of the harbour to the other.” And they continue their political talk. Thinking of old cultures and their ways of passing narratives and myths through the generations, Axel thought Australians didn’t have stories of their own to pass down. He’d read about the myths of indigenous people, the notion of a dreaming and the intricate stories it comprised. He wondered if Utzon knew these legends, their history in this place. Had he known anything of Aboriginal people when he designed his building? As he sat down and drew shapes that could turn a place sacred? Turn its people poetic? Their eyes to a harbour newly revealed by the building, its depths and colors new to them and surprising. Perhaps that was what the architect was doing here, creating a kind of dreaming, a shape and structure that would explain these people to themselves. Perhaps the building was just that, a secular Bible, a rosetta stone, a treaty, a story to be handed down. This picture of the Opera House that I took from the Harbour Bridge is the screen saver on my phone, so I see it every day. The draft in my country for the Vietnam War is another story. Kristina Olsson, Shell, Atria Books, 2018, 272 pages (I listened to the audiobook). Available through Amazon. Golly! I had no idea there was conscription in Australia for the Vietnam War. Geographically, SE Asia’s instability was a strategic threat to Australia. But still … so sad. It is sad to think about that war. Clearly the domino theory didn’t pan out. I did a little wikipedia reading to confirm that Britain not only didn’t have conscription, they didn’t send any troops.